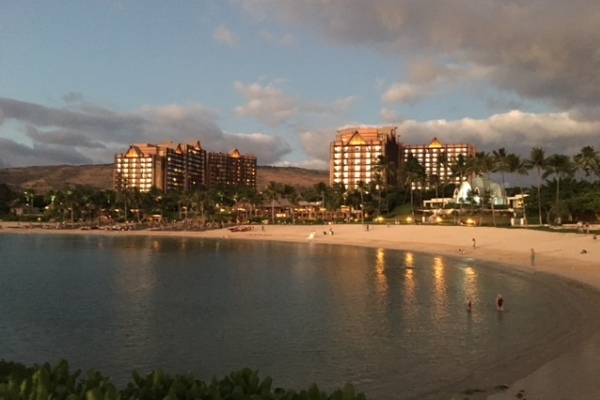 It has been a few years since MouseSavers founder Mary Waring visited Aulani, so in early November my spouse and I did a 4-night stay to check out what was new, what had changed, and to see and experience the resort and spa for ourselves. Situated on the leeward coast of Oahu, Aulani is somewhat off the beaten track in Oahu, in Ko Olina (“Place of Joy”), an area developed primarily for tourism. A newly opened Four Seasons hotel sits just next door, and other resorts and time-share properties, as well as a small shopping center, surround the three sides of the Aulani resort that do not face the water. The grounds in and around the resort are manicured and immaculate. The entire Ko Olina area is a lovely tropical oasis compared to the rugged, dry and barren hillsides that exist further inland. 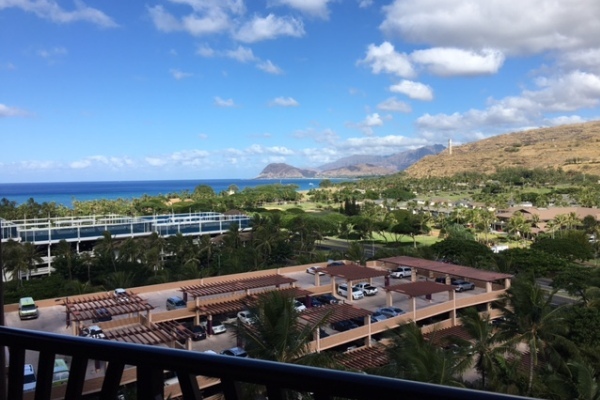 While Ko Olina is relatively remote, Oahu is not that large and you can easily drive to many attractions within 1-2 hours, while touring the island along the way. It’s about a 40 minute drive to the north shore, and about an hour to Kualoa Ranch. 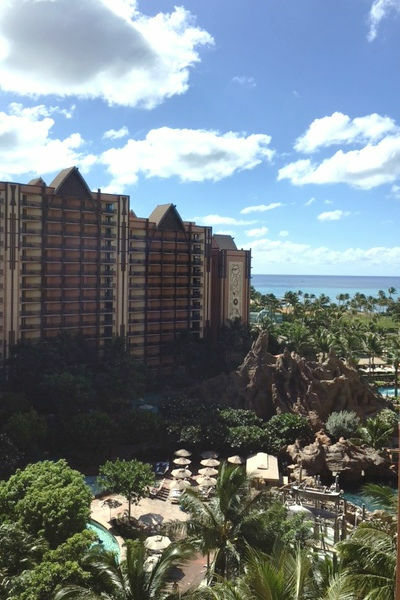 Click here to read more about Aulani, A Disney Resort and Spa. Back in July, I had priced out staying 3 or 4 nights at the resort, and found that with the “25% off a 4 or more night stay” offer, the average room/night cost dropped from around $459/night to $399/night in a standard “partial ocean view room” with the longer stay. At check-in the front desk staff was very friendly, as you would expect at any Disney-run property. We were presented orchid leis and told our room was ready, although it was still only 1:45 pm. However, we then discovered the room was a double-queen, not our requested king. I called the front desk, and they were able to accommodate us, although the new room was not ready. So we and our luggage went up and down the elevators more than once. Our room was clean and spacious, but also showing bits of wear, but pretty much what you’d expect after a few years of use. The upholstery and curtains were in decent shape; the sofa had clearly been given new back cushions and pillows. The robes in our king room appeared clean, but one was snagged and dowdy looking. The bedding was sparse with doubled sheets and a Hawaiian quilted throw. We didn’t think we’d be warm enough, so called housekeeping to request an additional blanket. One was delivered by a courteous attendant to our door in minutes. (We later discovered that the footrest/table in front of the sleeper sofa held extra bedding and a blanket that we could have used since we did not use the pull-out sofa.) Everything else with the room was fine. The king-size bed was a true king, and we were pleased with our partial ocean view although it did include a view of the Aulani parking garage and Four Seasons tennis courts.The parking garage was lit throughout the night so we needed to use the blackout shades to darken the room. There was a small balcony with two chairs and a small end table, although we didn’t use it much since street noise carried in that area, as did music from several nearby restaurants throughout the evening and ground maintenance during the night. During the day construction noise from new landscaping projects at the Four Seasons made it unbearable to keep the door to the balcony open. It appeared that the Four Seasons’ projects were close to completion, so this additional noise may have been only temporary. Late fall is a terrific time to visit Aulani. The crowds are relatively thin, daytime temperatures are in the upper 70s and humidity is no longer an issue. During a couple of evenings we strolled out to Aulani’s ocean cove and walked southeast along a path that led to a rocky shore where we listened to the waves crash as we watched the sunset from the shore. Hawaiian sunsets are not to be missed. During our stay, the evening air was balmy, and the sky was painted in moving rich orange and deep pinks mixed with at least five shades of blue and billowy clouds. The palms formed postcard silhouettes. It was beautiful. Aulani’s proximity to the ocean is sometimes hard to remember. So many activities take place within the three-sided courtyard of the resort, that it is easy to forget that the beach is just steps away. If you are longing to take a quiet swim in a protected cove, this is the place. The beach sand is a beautiful soft texture, perfect for children, and the water in the cove is warm and calm with a very gentle drop-off. We were surprised that the cove was not more heavily used, but then again there are many water attractions to choose from in Aulani. For a fee you can take the catamaran to the entrance of the cove; we did not think that looked very exciting and gave it a pass. A small booth set up by the cove rents snorkeling equipment and paddle boards as well. ‘Ama’Ama itself is nothing to write home about– it’s not much on atmosphere– very simple tables, no cloths, but terrific views of the cove in front of Aulani and evening sunsets. During lunch service the ocean view is partially obscured by the open umbrellas on the lounge in front of the restaurant. They do have a dress code, to keep out folks wearing swimsuits or cutoffs, but overall, if you’re a real foodie or expecting elegant dining, you will likely have more success next door at the Four Seasons. We were hungry, having just arrived from the mainland. We ordered accordingly, starting with Mochiko Chicken Wings with Kalbi Sauce, followed by a Caesar salad and Catch of the Day, a pan seared Mahi Mahi. We arrived around 2:15 pm, and the restaurant was empty. I had made a reservation before we left the mainland, and there had been nothing available before 2 pm, so I was somewhat surprised to find the place cleared out. In any case, our server was nice and attentive, if a bit chatty. He mentioned that if you can’t get a reservation at the time you want you should try just showing up; sometimes a number of tables are reserved for walk-ins. We didn’t do this so I can’t say it is absolutely so, but it’s probably worth a try. The Caesar at ‘Ama’Ama should not really be called a Caesar in my opinion, as it’s nothing like a good Caesar salad. This island Caesar had lovely dark green “upcountry romaine” island field greens, which were served as overlapping small whole leaves (nothing like a typical romaine), drizzled sparingly with a papaya seed vinaigrette. Pickled anchovy filets were laid whole and diagonally across the top of the salad (about 5 of them I think). The shaved cheese lacked the salty- peppery tang of a good parmesan, it was pale like pecorino or asiago. The croutons were served as thin slices of olive oil toasted baguette – but had an odd – almost rancid flavor, and the anchovies were pickled– like pickled herring! They carried none of the salty fishy goodness of a decent anchovy. While the salad was pleasing enough to look at, it was, well, just odd, and did not serve well at all as a complement to the other dishes we tried. The Catch of the Day was Mahi Mahi pan-seared and served on a generous scoop of sushi rice with cilantro oil, and a sweet black bean teriyaki flavored sauce. It was accompanied by three locally-harvested shrimp, slightly overcooked bok choi, and some tiny sliced sweet peppers and cilantro leaves sprinkled on top. It was a slightly confused dish in my opinion– the sauce overpowered the fish but was great on the bok choi– the rice was wonderfully light and slightly sticky (yum) and was good with the fish or the sauce, but not quite both, and the cilantro oil was great with the fish, but not with the bok choi… you get the idea. I had seriously hoped to counter Mary’s review from 2012 with better news, and indeed, the meal wasn’t a total flop– just some real ups and downs. They did have a nice selection of non-alcoholic ‘mocktails’, several of which sounded refreshing and not overly sweet. I tried the Lilikoi Splash– with passion fruit juice, fresh lime juice, a splash of soda water and heaps of muddled mint. It was very good, and if you’re a mocktail mojito fan, it’s a very nice version made with Aloha. Our travel package included daily breakfast for two at the Ulu Cafe. This service option was an uncomplicated and quick way to start the day with a choice of American standards: scrambled eggs, potatoes, bacon, sausage, french toast, Mickey waffles, etc., and saved the two of us about $25/day. The self-serve coffee was perfectly fine, but the fruit cups a disappointment, not at all reflecting a freshness or choice you would expect on a tropical island. As with most things Hawaii, the seating is outdoors, in lovely fresh air. Full plate breakfasts (the works) ran $12; the rotating hot plate lunch was $15. If you do have a hankering for a latte or espresso, the choices at Aulani are limited. The bar next to the adult pool (just to the north of the Ulu Cafe) has an espresso machine that is in use until 10:30 in the morning. Anytime after that, outside of regular and decaf, your coffee addictions will need to be satisfied outside of Aulani. Ordering a Shave Ice (yes – it is called “shave”) in Hawaii is a bit different than your average snow cone. The ice should have a nice soft texture that absorbs the flavor syrups through and through. For an Asian twist, you can add sweetened condensed milk as well as a scoop of ice cream, though we did not. We ordered a mango, lilikoi (passionfruit) and li-hing-mui (sweetened tart plum). The flavors were intense and sweet and played well with the soft icy cold. As the shave ice melted, we realized it might be best to stick to a single syrup to avoid having all flavors get mixed together. We agreed with Mary’s review –Aulani does a nice job with shave ice. As it happened, our time at Aulani coincided with Aulani’s first Lu’au. We were told that the Lu’au was being added as a scheduled event and we were pleased and excited to be part of this new Aulani experience. Because Aulani has made an effort to echo the history and traditions of Hawaii in its architecture, cultural displays and menu choices, we felt the ticket price (at this writing $159 for adult /$109 child (ages 3-9) VIP seating, $119 adult/$79 child general seating) was going to be worth it. The roots of the Lu’au can be traced to the time of the kings. It has evolved to be a celebration of food, heritage and community. The traditional Lu’au is much more than an incredible buffet eaten while sitting at long tables – it is a time to come together to celebrate with song and storytelling the lore and history of the extended family. We knew that this combination of entertainment, storytelling and large group dining was a perfect recipe for a successful Disney event. We were eager to see what Disney magic we would experience. We lined up outside of the Hālāwai Lawn area, were greeted individually and presented a simple shell lei (the more elaborate leis were reserved for the VIP guests), and shown to the complimentary pre-poured alcoholic beverage table for adults. Surprisingly the only non-alcoholic beverages were the juice cups for children. Staff was plentiful, and we were directed to pick seats at a designated long table (we estimated about 275 seats were available). A band was on stage playing traditional Hawaiian music, setting the mood. At this point we chose our seats, sat for a moment and wondered what would happen next. After about half an hour the Master of Ceremonies took to the stage to welcome us and to invite us to visit the activity stations set up around the periphery of the dining area. All activities were designed with keiki (children) in mind and to be reflective of traditional life on Hawaii. There was a station for pounding the taro root to make the food staple poi; a station for stamping patterns on paper with carved bamboo sticks, a station to weave flowers into bracelets and a station to receive a custom “tattoo”. Four imposing Hawaiian men heavily tattooed with very intricate Polynesian inspired designs – all wearing the traditional loincloth – were patiently drawing similar designs on participants’ outstretched arms with felt tipped pens. While all of the activity stations were busy and the younger children seemed happily engaged in the first three, the tattoo station was by far the busiest, and almost exclusively attended by adults, including us. We both enjoyed this experience, and were sorry to watch the “tattoo” fade and disappear by the third day. Tip: Get in line early or be ready for a long wait. The call to be seated came about an hour into the start of the festivities; at this point Cast Members walked around selling drink tickets. Much like at a wedding, tables were called in turn. The food was tasty, abundant and well displayed. Dishes traditional to a Lu’au were well prepared: ahi poke (cubed raw tuna marinated in lemon juice and green onions); lomilomi salmon (small pieces of smoked salmon, onion and tomatoes), several preparations of poi (mashed taro) – the one served like mashed potatoes with shredded coconut was quite good – and a whole roast pig presented on a bed of banana leaves. There were multiple variations on chicken dishes, pulled pork with Maui onions, a prime rib station, and of course – macaroni dishes. Unfortunately, we did not get a chance to sample the roast pig – clearly the organizers had underestimated the crowd’s interest and it was gone in a flash. The dessert offerings were heavily tilted toward lovers of coconut; judging by a casual glance at other tables the banana bread pudding was a crowd favorite. Early in the evening, the MC invited her brother to join her onstage and throughout the dinner and dessert they took turns telling and singing stories of their ancestors. The powerful duet they sang to their late mother was moving and very intimate; other stories were filled with humor or little bits of information about life in Hawaii long ago. Dancers (including the tattoo artists) performed traditional dances – including, of course, hula dances. An additional small stage had been set up halfway up the middle aisle and was used intermittently throughout the evening as well. I thought this was a nice touch; it made for a more dynamic experience and gave those of us sitting in the back a closer view. But the oddly halting and disjointed pace (the band repeatedly took the stage to fill the gaps), and the long pauses left us wondering if Aulani had gotten ahead of itself and was not quite ready to deliver the show we expected. We both thought the best part of the show was the entrance of men in full tribal costume including wonderfully inventive headgear. This was Disney at its best – imaginative, beautiful, surprising and engaging. Add the dance with fire batons, and the show really took off – for about half an hour. We imagine that Aulani has addressed these shortcomings; we kept reminding each other that this was their very first Lu’au and that many of the timing hiccups will be smoothed out. If you are looking for a really splashy luau with fire dancing and drums, this may not be it– at least not until the very end. But if you want your kids to enjoy some family-oriented storytelling, beautiful costuming and a sampling of the traditional Lua’u right on the grounds of Aulani, check it out. Note: you will want to check the website for the schedule and make a reservation well ahead of time. During fall and winter seasons bring a sweater as the night temperatures may fall just enough to make sitting for a long time a bit chilly. Since this was a honeymoon/anniversary vacation for my spouse and me, I had booked a couples massage at Laniwai and was very much looking forward to experiencing the wonderful water features that I’d read about. It was nearly everything it claimed to be, and we had a truly a blissful afternoon. We showed up a little early, about one hour before our appointment – I was curious to see if they would accommodate us earlier than the standard admittance of 45 minutes early. We were received immediately, and the journey through Laniwai began. We were checked in, and then our guide invited each of us to pick a stone out of a basket with an inscribed word and told a bit about Laniwai. We then followed our guide through a softly lit blue tunnel, known as the tunnel of transformation. At the end of the tunnel is an interior pond, where we were told to release our stones. It was a very nice transition from the noise of pool activities in the Waikolohe Valley, the area housing all of Aulani’s pools, waterslides and restaurants, into a serene and relaxing environment. We were given an unhurried tour of the locker room, women’s quiet rest area, mixed quiet rest area, dry and wet saunas. Our guide gave us an overview of the massage experience (one can choose to stay partially clothed). She ceremoniously prepared us two small containers of body scrub that we were free to take back to the hotel with us – one was the signature Laniwai fragrance, the other a slightly sweeter fragrance – and then took us outdoors into an enclosed courtyard. The courtyard tour included explanations about the several soaking pools, whirlpool bath with waterfall, cold plunge (my partner tried this; I didn’t, being a bit of a wimp about icy water). There are also a number of lounge chairs with comfy cushions and several cabanas, without the televisions and snack bars you find in cabanas around the pools. The highlight of the outdoor courtyard is a tall stone circular area reminiscent of Stonehenge, which partially encloses a number of differing shower option stations. There is a multi-focal shower that directs jets of water horizontally at various body parts (at high velocity – be careful of your eyes), an inverted waterfall (rising out of the floor), and several versions of rain showers with just enough force and volume to feel wonderfully extravagant. The water is a bit warmer than body temperature and is glorious to experience out of doors. The massage itself was a treat, however I did expect the couples massage room to be a bit more, well, romantic – more like the photos on the website, with candles or brightly colored flowers floating in glass bowls and soft lights… The room was actually fairly clinical, with two massage tables about eight feet apart in an unremarkable room with double doors that led out into a lovely private courtyard. I guess the fact that the massage therapist closed the doors to the courtyard became less important during the massage, since our eyes were covered in a warm and heavy mask or we were looking down at the floor through the headrest. We requested that the audio be changed from upbeat acoustical Hawaiian music to a more meditative selection, which the massage therapists were happy to do. Both of us have received a number of massages in our life and are comfortable with the process. If you prefer to keep some items of clothing on, the massage therapists are happy to accommodate. The full-body treatment was typical of what you would expect in a massage, and included a Thai style stretching of the legs and hips. I continue to be impressed by the skill required to execute the complex wrapping of sheets to maintain modesty while the stretching happens. Both massages seemed to follow a script with little deviation; we compared notes afterwards and agreed that the variations between our experiences were minor. The massage session was expertly done but somehow felt a bit mechanical; I suppose that is part of the nature of spa treatment. We both agreed that there was little benefit in having chosen a couple’s massage, since we never saw each other and we were so far apart. But by and large, the experience was therapeutic and relaxing. A few small changes (a less clinical décor, opening the doors to the courtyard after the massage, being greeted by a more contemplative music selection) are all that are needed to make this a more romantic experience. Compared to the average spa, Laniwai is pricey. An 80-minute Honi-Honi couples massage was $450 ($560 after mandatory gratuity and taxes). The spa is otherworldly compared to the rest of the resort, very adult-oriented, and is serene and fairly quiet. If you really need some rest and relaxation it is a very nice way to spend a full afternoon. We left feeling indulged, relaxed and rejuvenated. 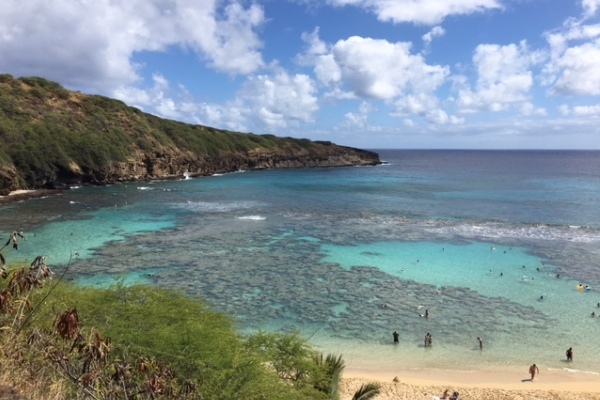 If you are considering snorkeling, do not miss visiting Hanauma Bay. Several years ago Hanauma Bay became a protected wildlife area in order to lessen environmental damage to the coral, fishes and beach area caused by 10,000 visitors a day. The park now limits daily attendance to 3,000, and there is very limited parking, so plan ahead! It’s best to have rented snorkel gear prior to getting there, but if you haven’t, you can rent snorkel gear right on the beach for about $20/day (more if you want the “Platinum” package which includes the new high-tech face mask/snorkel all-in-one). We used the Premium package with a perfectly fine silicone edged mask and snorkel with a water shut-off valve so water can’t flow into the tube if you dive under or are hit by an overhead wave. The package also comes with one-size fits all fins that are adjustable and are fairly comfortable, although not quite as comfortable as slip-on fins. I cannot say enough about what a treat snorkeling in Hanauma Bay is. I have snorkeled in a number of places on several islands in Hawaii, and Hanauma Bay snorkeling is truly a not to miss experience. You’ll see numerous colorful, tropical fishes in all shapes and sizes – including the famous humuhumunukunukuapua’a, brilliant wrasse, Moorish Idols, parrotfish, triggerfish and butterfly fish – as well as some untouched coral in lavender and neon yellow colors attached to sides of lava and coral rock formations. The entire bay is filled with varying levels of lava rock and coral including a number of coral plateaus that are only 12 – 30 inches deep. Here you can float and skim along the surface and see numerous fishes and schools of fish up close as they feed in the shallow bay’s warm waters. There are numerous drop-offs where you can stand on white sand 3 – 5 feet deep, just next to a coral outcropping. With minimal effort you can enjoy some fantastic otherworldly underwater beauty! If you are a highly experienced snorkeler, snuba or scuba diver, you can brave some of the bay’s outer edges and deeper waters. Novice and beginner snorkelers no matter their age should be wary of the surf, tide and undercurrents which can be strong and have been deadly to those unaware. Note: Hanauma Bay is not the best place to take very small children as there are not many areas free of coral, there are no play structures, and shade is hard to find. Tip: If you arrive between 6:00 and 7:00 am, before the ticket booth opens, you don’t have to pay the $7.50/person (kids 12 and under are free) entrance fee. A park ranger will give you instructions and let you walk down to the beach. The snorkel equipment booth does not open until between 7:30 and 8:00 am. The resort is beautiful, and the attention to details – both culturally in the art and decor of the resort, and personally in staff hospitality and attention to guest experience are what you would expect from a Disney resort. However, the resort’s pool and waterpark area feel a little cramped. There are an enormous number of features (pools, lazy river, kiddie areas, walking paths, lounge chairs, snack shops, etc.) thrown into a relatively small area. Even in the off season the resort was very noisy when crowded with guests and their families midday. You must either go to the spa, the beach or away from the resort for a drive if you want the relaxation and aloha spirit for which Hawaii is known. 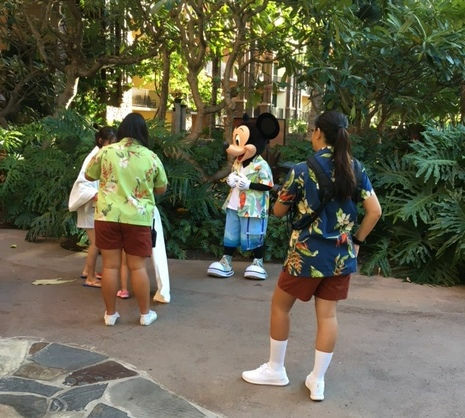 As you’d expect from Disney, the resort is super family-friendly, and if you are traveling with children under the age of 12 or so, we expect they’ll have a blast in the pools, or spending time at Aunty’s Beach House learning to hula or make Hawaiian-style arts and crafts. There are several zero-entry splash areas, and plenty of nearby seating for parents or adults, and the Waikolohe Valley pool area theming with various rocky grottoes and lush plantings is pretty terrific. There is a LOT to do right at the resort, and it would be easy to stay there and not leave if you are looking to experience all that Aulani has to offer. If you do want to explore the island of Oahu, it will take some extra planning and extra time to get to your car, and then drive to your destination. Most tourist destinations are within an hour to an hour and a half away by car. It is nice that valet parking is same cost as self-parking, but if time is a factor, you may want to opt for self-parking anyway. If you are not a DVC member, you might be under the impression that Aulani was built to sell DVC memberships. The large majority of the guests are members; the Valet asks if you’re a DVC member, as did our restaurant server. There is a DVC sales office you pass when getting to non-DVC rooms, and DVC sales signage is abundant on the resort. You feel a bit like a stranger if you are not. There is almost an air of “if you are not a member then why are you here?” If you are a DVC member, you can expect to be welcomed and pampered. A note about traveling around Oahu: If you leave Aulani and need to drive through or to Honolulu to get to your destination, be aware that traffic to and from Honolulu is extremely heavy. If you are traveling during rush hour (5:30 – 8 am or 2:30 – 6:30 pm), be prepared to add 45 minutes or more to your travel time. There is an express lane (HOV lane) for 2+ persons, just know that the exits are limited to one just past the airport and one into downtown Honolulu.